The last barrier to robotic shipbuilding has just fallen. What comes next will be truly exciting. It wasn’t too long ago that SSI and Wolf Robotics demonstrated some co-development which automatically drove a fully autonomous welding robot to weld several ship panels. SSI develops Autodesk based solutions for the shipbuilding and offshore industry including ShipConstructor software, an AutoCAD based CAD/CAM product line; and EnterprisePlatform, a tool for sharing product data model information. For its part, Wolf Robotics has been integrating robotic welding and cutting systems since 1978. The collaboration was part of a National Shipbuilding Research Program (NSRP) Computer Aided Robotics Welding (CAR-W) project with U.S. shipyards. Prominent among those participating shipyards was Bollinger, who today is testing that cutting edge technology, hoping to be up and running by mid-year, as it builds the U.S. Coast Guard’s all-important Fast Response Cutters (FRC). According to SSI’s R&D Manager Patrick David, the project focused on looking for ways to reduce manpower costs, as well as standardizing and producing better quality welds. He explains, “The big problem for shipbuilding in terms of using robotics is that there is a high degree of product variability. Even though ships of the same class are going to be very similar, the nitty-gritty differences are enough that it wreaks havoc on trying to set up a purely automated manufacturing system/assembly line.” And, with those obstacles in mind, SSI, Wolf Robotics and Bollinger Shipyards embarked on the remarkable project. And while this effort, to date, isn’t the end of the journey, it likely represents a quantum leap forward in shipbuilding efficiencies on this side of the big pond. The team then set out to develop software algorithms for high impact weld types centered on robot reachability, collision avoidance and auto-path generation kinematics that use electronic CAD Model and Welding Process Planning data. A gap analysis of the required changes between Bollinger’s current processes and the generic industry CAR-W process map was developed by the team. Today, says Fanguy, “We are developing a roadmap of alignment for other shipyards to follow. Finally, the project will attempt to leverage and help develop an electronic infrastructure that captures critical process knowledge (in electronic data form) related to welding so that it can be electronically leveraged by designers for Design For Robotics (DFR) applications, as well as by process planners and engineers.” Unspoken in all of that, it is also true that process data capture and transfer of welder knowledge is a critical risk associated with the aging welding work-force and welder workforce shortage in the shipbuilding industry. Already up and running and producing real results in Bollinger’s, the workflow starts in ShipConstructor by automatically identifying the welds in the ShipConstructor 3D CAD model. The ShipConstructor user then uses an interactive 3D visual drawing to configure the weld properties such as the weld standard and includes weld breaks, weld pitch, etc. The weld information and various other relevant data (e.g. geometry of panel to be welded) is exported to Wolf Robotics via SSI’s EnterprisePlatform. The operator on the shop floor reads the files generated in Robot Studio which runs a path planning algorithm that evaluates several collision avoidance scenarios. Bollinger is the only shipyard testing – and using – this technology today. Bollinger bought the robots, got the overhead gantries into place and rigged all of the equipment. And says SSI’s David, the success of the project at Bollinger has raised enough eyebrows at other shipyards that the NSRP project’s next phase will involve more than just one robot. According to Bollinger’s Fanguy, the project team generated ROM (rough order of magnitude) costs of the system concepts and worked with Bollinger to develop ROI and payback estimates using Bollinger’s plans for implementation to apply timing to estimated savings and utilizations. An adoption curve was applied to reflect the rate at which CAR-W systems could realistically ramp-up to expected production capacity. This adoption curve was meant to capture the timing for organizational alignment, information flow infrastructure, personnel training, etc. The adoption curve used shows 0 percent adoption for 2015 during development, 1 percent in 2016 with prototype systems, 20 percent in 2017 for CAR-W production applications, and 80 percent and 100 percent in 2018 and 2019 respectively. To be fair, both return-on-investment and payback period metrics are expected to fluctuate by yard based on the pace at which robotic systems are brought to full production capacity. Additional financial savings not addressed in this business case include benefits derived from reduced welder ergonomic issues. Costs associated with over-welding, including additional man-hours, the increased ship weight, increased hours of material grinding in the case of rejected welds, and other variables were not considered in the calculation. David continues, “The biggest obstacle, hands down, is the upfront capital investment.” And he agrees with Fanguy, saying, “This isn’t just limited to series-build hulls – one-off projects can significantly benefit as well. 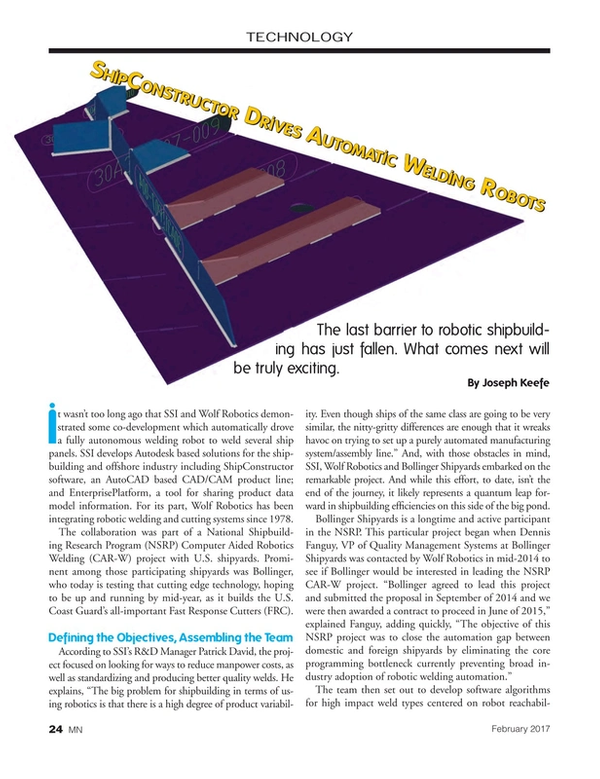 What used to take many hours for the programmer or the robot to generate a path for the welding now is exponentially faster than it used to be.” That’s good news for boatbuilders. As NSRP continues to lead, and shipyards and other stakeholders collaborate, everyone wins. That reality has never been clearer.